Pay Per Click ads — or PPC — are an important digital marketing strategy for any company that wants to grow their business. PPC ads help companies better control their advertising budgets. They also bring in more qualified traffic; in fact, studies show that PPC visitors are 50 percent more likely to purchase something on a website they visit than people who find the same website via an organic search. 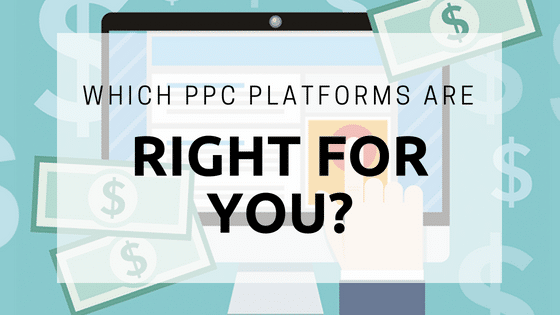 There are several main PPC platforms where companies can choose to place ads: Facebook, LinkedIn, Google AdWords and Bing Ads. Here is a little information about each, so companies can determine which platform best suits their needs. Facebook isn’t just a social media network where people can keep up with friends from elementary school. It’s now a powerful platform for advertising, since it has more than 1.2 billion active monthly users. One of the benefits of PPC ads on Facebook is that the platform allows companies to be specific about the audience they want their ads to appear in front of. Companies can use Facebook’s tools to narrow down audience by things like age, geographic location, language, gender and more. LinkedIn is a social media network focused on professionals. The best fit for LinkedIn PPC ads are B2B companies — those that choose to market to other business professionals. While LinkedIn’s audience is smaller than Facebook’s, the platform also offers the ability to narrow down audience by skills, interest, job title, employer and more. Google AdWords is arguably the king of all PPC platforms. In fact, reports show that Google earns 78 percent of all US search ad revenue. Because Google AdWords has such a wide reach, it’s a good choice of PPC platforms for a wide range of companies. It also gives organizations tight reins over their advertising costs, so they can spend more if campaigns are working or cut back if they need to spend less. Bing is another of the web’s most popular search engines, and it also offers a PPC platform where companies can advertise. Bing Ads reaches 68 million searchers that aren’t reached on Google. People choose to use Bing Ads because it offers less competition than AdWords and because Bing Ads gives companies more geo control over the audience seeing their ads, meaning they can get more specific about who is going to see the ads.